Safe Manual Handling: Have We Got it Wrong? Home » Blog » Workplace health and safety » Safe Manual Handling: Have We Got it Wrong? Over several decades there has been considerable effort by organisations to reduce manual handling injuries. The focus has been on redesigning lifting activities to whenever possible, use manual handling aids, such as lifting devices. 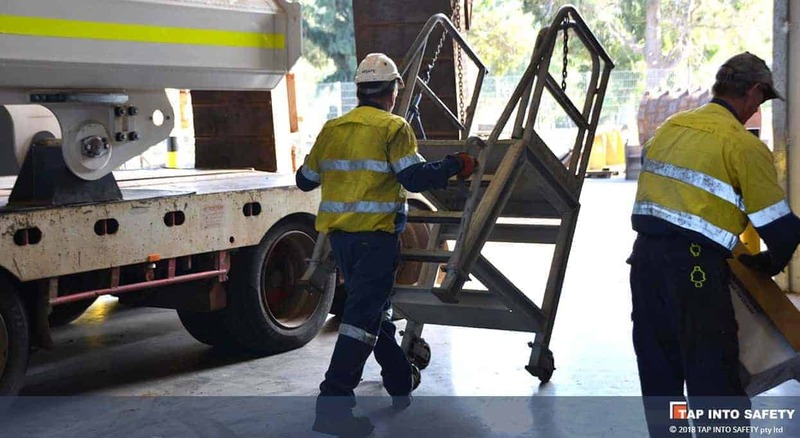 When manual handling activities have required people to perform the lifting activity, emphasis has been placed on the correct and safest way to lift. There’s a whole discipline around the problem of reducing manual handling injuries known as participatory ergonomics. Companies have spent countless hours training and implementing participatory ergonomics programs. However, recent research has questioned if all this effort has actually reduced manual handling injuries. The method of lifting when manually handling objects is once again under the spotlight. For this post, we review a recent publication that provides a summary of lessons learned from companies who have implemented ergonomics programs to reduce musculoskeletal injuries, as a result of manual handling activities. What is a Participatory Ergonomics Program? When organisations embark on a participatory ergonomics program the purpose is generally to improve the design of how work is performed. A team is generally formed that includes employees and experts typically focussing on reducing musculoskeletal injuries. For decades, participatory ergonomics programs have been implemented across a large range of industries, including mining, construction, office environments, health care and manufacturing. There are many variations in how these programs are run and what is included. For example, the degree and nature of participation, the extent of expert facilitation, the training provided to teams and the tools employed to identify issues and develop solutions. The level of commitment also varies considerably and also very likely to influence the outcomes of ergonomics programmes. It is when management and employees work together to improve workplace conditions, reductions in manual handling injuries can be achieved. Management commitment is critical. Will a focus on ergnomics help? Workplace ergonomic programmes have ben reviewed in terms of benefits to the economy. For some industries, such as manufacturing and warehousing the evidence of a positive impact was high. This decreased to moderate impact in the administrative and support services sector, and health care sectors, and was limited in the transportation industry. This showed that ergonomic programmes had limited influence on reducing manual handling injuries for several key business sectors. The outcomes of a large number of evaluations conducted over the last two decades on the effectiveness of ergonomic programmes to reduce manual handling injuries are mixed. Many are successful, but others are clearly not. When evaluated in terms of a positive impact on musculoskeletal injury symptoms and reduction in compensation costs, 10 studies prior to 2004, showed that participatory ergonomics programmes failed to make an impact. However, a further 12 studies conducted up to 2006 provided partial to moderate evidence that participatory ergonomics programmes have a positive impact on: musculoskeletal symptoms, reducing injuries and workers’ compensation claims and a reduction in lost days from work. For example, 402 ergonomic changes were made to 199 kitchens in Finland together with a participative ergonomics programme involving six 3 hour workshops. There was no impact on the number of musculoskeletal injuries. In another test, 4 production sites introduced changes to workflows and once again, no statistically significant effect on health outcomes could be detected. However, for this study, production pressures were noted as a barrier at each site and management commitment varied. A later study in Holland involving a single six hour meeting with 19 working groups in randomly assigned departments across four Dutch companies did not result in reduced low-back or neck discomfort, although a significant effect on recovery from back pain was noted. Finally, in 2014, a programme consisting of six 10 minute tool box talks in small construction firms, resulted in employee knowledge improvement and changes to work practices and tools, however, no changes in musculoskeletal symptoms were observed. Once again, commitment to the programme was cited as a barrier. Senior management commitment is essential. When embarking on a drive to reduce manual handling injuries, resources and support must be made available. Time needs to be set aside for team members to participate in training and intervention activities. Expenditure required to implement workplace changes must be approved. The research is showing that failure to meet these requirements will impeded any positive results. On the positive side, improved health effects were noted in a 2004 ergonomic programme for a courier company. This company formed an ‘ergonomic change team’ that included managers, employees and a facilitator. They team underwent 6 hour training sessions, they met weekly for 7 months, and twice a month for a further 7 months, they modified their workstations and reduced conveyor speeds. “a systematic approach to ergonomic hazard identification, quantification and control implementation, in conjunction with requirements to establish an ergonomic process …may be effective in reducing risk of MSD and acute injury outcomes”. There are numerous analytical tools on the market including checklists to record manual handling risks, those that rank tasks according to likelihood and severity and those that identify tasks with high ergonomic hazards. These tools serve a useful purpose, however the authors of this study call for training as a first step, to ensure employees and management understand ergonomic concepts and techniques. They specifically recommend online training and video delivery methods to provide engaging training and increase participation. How can Tap Into Safety help? The Tap Into Safety Platform provides interactive training using virtual environments, gamification and animated videos. The training is delivered online and on smart devices and can be integrated into a company’s safety induction or safety training regimes. We have a considerable library of pre-built training modules for high risk industries including, construction, civil construction, mining, warehousing, transport, offices and service providers. Almost all training modules include content on manual handling. But the difference is the training is situated within the context of the industry setting. Manual handling activities vary widely between industry, for example, manual handling on a construction site entails shoveling of materials, whereas manual handling in an office may require the lifting of boxes. Training around these variances is essential to embed the knowledge of safe lifting techniques. First and foremost, we encourage the use of mechanical aids and improvements to work flows to reduce the need to conduct manual handling activities. In doing so, we look forward to a reduction in musculoskeletal injuries. This research was interesting in that it highlighted a lack of evidence that participatory ergonomic programs had a positive impact on reducing workplace manual handling injuries. The authors recommend eliminating hazardous manual tasks through redesign. They suggest that harnessing the expertise of the employees who undertake these tasks through a participatory ergonomics process has the potential to both ensure that the solutions proposed are optimal and will be accepted by other employees. Successful implementation of participatory ergonomics requires ongoing management commitment at all levels and genuine participation from employees. They recommend training in ergonomic principles and tools for the efficient analysis of manual task risks. It is all down to the training, and how we give the information to the work force, and also remember that you cannot have mechanical lifting in all areas of construction work. The operatives have to lift items, to be able to carry out their normal works, therefore training, instructions and correct supervision, of all manual handling is of the utmost importance. Thanks George for your comment. You’re right, you can’t always use a mechanical aid in the workplace and there are times that you have to lift and carry and often repetively. Training is the next risk mediation tool on hand but the mistake that can be made is the one off course on manual lifting and the thought of “we’ve trained that!”. It’s that continual reminder that needs to occur before safe lifting becomes a habit.